Episode 16 of Inside BU Hockey features Bernie Corbett’s interviews with Head Coach David Quinn, freshman defenseman Dalton MacAfee and longtime BU goalie coach Mike Geragosian. MacAfee, the son and grandson of NFL receivers, joined BU after being a two-sport standout (lacrosse and hockey) at St. Sebastian’s. Geragosian, now his 12th season on the BU staff, has helped develop Terrier netminders including Sean Fields, John Curry, Kieran Millan and most recently, Sean Maguire and Matt O’Connor. Coach Gera also is the director of development for goaltenders for USA Hockey in Massachusetts. 2014 recruit Jack Eichel scored the game-winning goal and added an assist as Team USA defeated host Russia, 5-2, in the opening game of the Five Nations Tournament in Dmitrov. 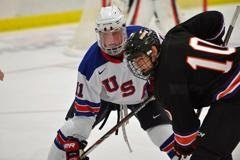 In 31 games with the NTDP U18s, Eichel’s scoring line is 23-25-48 and he has been on the score sheet in 25 of the 31 games. 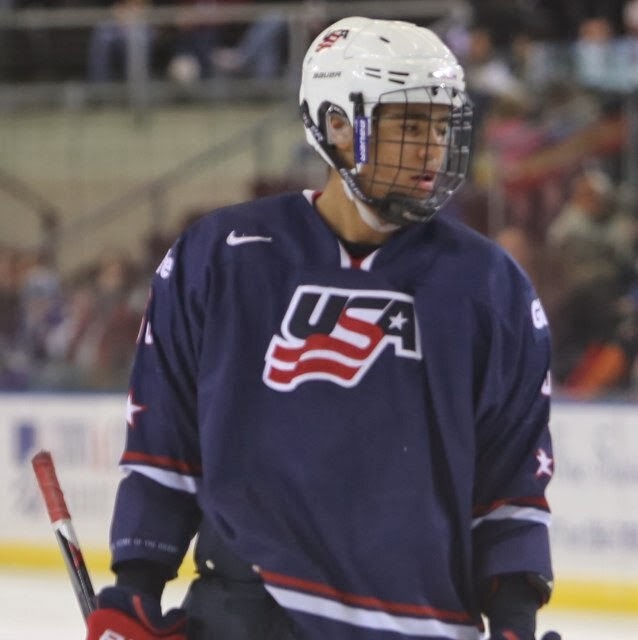 Fellow 2014 recruit, defenseman Johnathan MacLeod assisted on Team USA’s fourth goal. Next up for Team USA is Finland on Thursday. A pair of 2015 recruits helped the U17s, also playing in a Five Nations Tournament, win their opening game, a come-from-behind 6-5 victory. Left wing Jordan Greenway (left) assisted on two goals and defenseman Charles McAvoy assisted on a power play goal. 2016 recruit Clayton Keller rang up three goals and two assists as Shattuck St. Mary’s Prep swept a weekend series from Culver Academy in Faribault, Minn. The sophomore wing from Illinois tallied a goal and two assists in Saturday’s 4-1 win, then found the next twice, including the game-winner, on Sunday as the Sabres won, 5-3. 2014 recruit Chase Phelps assisted on two SSM scores. After 39 games, Keller’s scoring line is 28-32-60 and Phelps is at 20-31-51. With Bruins captain Zeno Chara in Sochi for the Olympic games opening ceremonies, Boston has recalled former Terrier David Warsofsky. The blueliner from Marshfield, Mass., played four games for Boston in an earlier call up, scoring one goal. 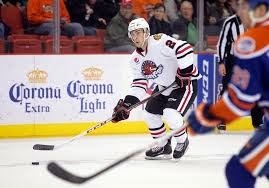 Adam Clendening (photo) assisted on two goals for AHL Rockford as the Ice Hogs outscored Hamilton, 6-4. The right-shot defenseman who scored 46 points last year as a rookie now has a 6-29-35 scoring line. Terriers lost to Boston College, 4-1 in the Beanpot opener at Conte Forum. BU’s only goal was Sarah Lefort’s 22nd of the season, assisted Caroline Campbell. Goalie Kerrin Sperry stopped 28 Eagles shots.